In theory, central banks should care about money market volatility for at least two reasons. First, it may impede the transmission mechanism of monetary policy, reducing the central bank’s ability to accurately control monetary conditions in the real economy. Second, it increases uncertainty for market participants. This may raise the costs to firms of managing their liquidity and, in the extreme, may even dissuade firms from participating in these markets altogether. But lower volatility may come at a price. A common way in which central banks have tried to control market rates is via the use of corridor systems (Bindseil 2004). In these systems, banks can borrow (or lend) to the central bank at a spread above (below) the policy rate, ensuring that market rates will trade within the limits of the “corridor”. In such a system, reducing volatility by narrowing the corridor will tend to reduce the depth and liquidity of the money market (Bindseil and Jablecki 2011), since it makes it less attractive for market participants to trade with each other and hence encourages more money market transactions to be settled across the balance sheet of the central bank. This could have potentially adverse consequences for the meaningfulness of market interest rate benchmarks (such as SONIA and Libor rates) and market discipline of banks. And corridor systems, which typically rely on maintaining a constant level of scarcity of reserves, may also reduce the flexibility that central banks have to respond to large swings in reserves demand (Jackson and Sim 2013). Have changes to the BOE’s framework reduced overnight volatility? In staff working paper no. 588 I use a GARCH modelling framework to show that reforms to the BOE’s operating framework have been associated with significant reductions in the volatility of overnight rates. The chart below shows a simple illustration of this result. The blue line is the residuals of a regression of SONIA (a measure of the overnight interest rate) on lags of itself, changes in Bank Rate and various calendar effects. 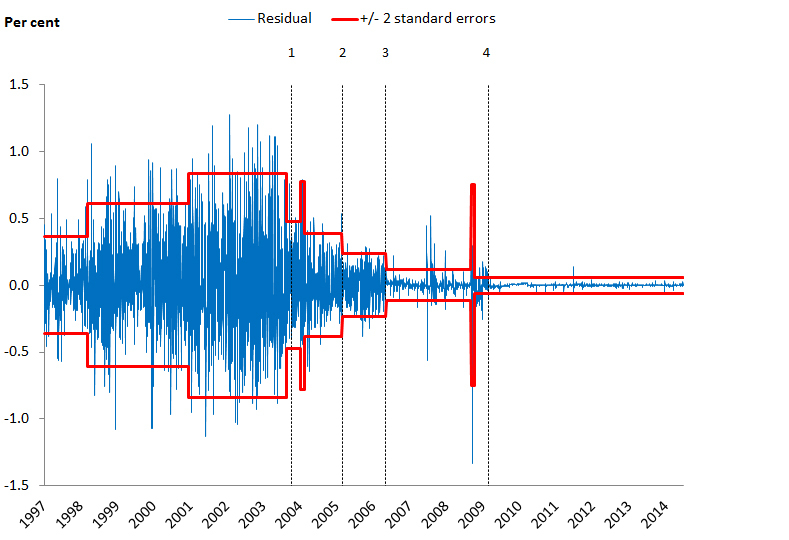 The red lines show +/- 2 standard error bands using the conditional variance estimated using a flexible GARCH model which allows for multiple structural breaks at unknown dates. Changes in the width between the red lines represent structural breaks in the estimated level of volatility. In the late 1990s, the BOE operated a zero-reserves system in which banks were incentivized to hold a near-zero reserves balance overnight and the BOE facilitated this by entering the market several times a day to supply the reserves banks needed to settle their obligations. Overnight rate volatility was high and reached its peak in the early 2000s. As a result of the high level of volatility, a review of the operating framework was announced in 2003 by Governor King. There was a significant fall in volatility around the time of this announcement, which might reflect market expectations that the BOE would now tolerate a lower level of volatility before intervening, and a further fall following a set of interim reforms carried out in 2005. The new “reserves averaging framework” (RAF) was introduced in 2006. Banks set voluntary reserve targets which they had to meet on average over each reserves maintenance period. So, if a bank’s average balance remained within a range around their target, the balance was remunerated at the official Bank Rate. If banks’ reserves moved away from target then they could borrow from or lend to the BOE via standing facilities, and the rates on the lending and borrowing standing facilities formed an interest rate “corridor” for market rates. Such a system is thought to reduce volatility (Whitesell, 2006) and the RAF was associated with a large fall in volatility when it was introduced. But in late 2008, overnight rate volatility spiked to levels previously seen in the early 2000s. This was caused by elevated counterparty credit risk concerns and large and rapid swings in reserves demand (see Jackson and Sim 2013), which were difficult to fully accommodate within the RAF given that banks were required to pre-commit to a voluntary reserves target over each maintenance period. As a result, the parameters of the RAF were relaxed to allow banks more flexibility. Then, in 2009, the Monetary Policy Committee (MPC) began its QE programme of large-scale asset purchases funded by the creation of reserves and the RAF was suspended. The QE created a large volume of new reserves and a floor framework was introduced, in which all banks’ reserves were remunerated at Bank Rate, ensuring that market rates remained close to Bank Rate. Volatility fell around the time of the introduction of the floor framework and has remained low since then (this is the lowest volatility since our sample begins in 1997). Does overnight rate volatility matter for monetary policy transmission? So, reforms to the operating framework can significantly reduce overnight volatility. But how important is overnight volatility for the transmission of monetary policy? My analysis shows that the benefits of lower overnight volatility, in terms of facilitating the monetary policy transmission mechanism, may be limited. More specifically, higher overnight volatility does not seem to be transmitted into the volatility of term rates (which here refers to interest rates with a maturity between 1 and 12 months). Specifically, there is no transmission of overnight volatility into overnight index swap (OIS) rates up to 12 months maturity, except in the pre-RAF period 2001-2006, and even then the effects are quite small. There is no evidence of transmission into the 3 month Libor rate, which is the key money market benchmark for pricing many derivatives and corporate loans. So term rates – which are a more important component of financial conditions for corporates and households than overnight rates – are not much affected by the volatility of the overnight rate. What does drive short-term interest rates, if not overnight volatility? These rates are closely correlated with the rates of equivalent maturity in the US and EA (as shown previously by this post). I also find roles for surprises in macroeconomic data releases and for the MPC’s monetary policy communications. The results show that when changes in Bank Rate are expected, they have smaller effects on term rates (as above, those between 1 and 12 months in maturity) relative to unexpected changes. And the introduction of explicit forward guidance policies by the MPC in 2013 and 2014 coincided with lower volatility of short-term rates. These findings suggest that when monetary policymakers provide greater guidance on upcoming decisions, this tends to reduce the volatility of short-term rates. The design of operational frameworks is likely to be a key focus for central banks over the next few years as they consider whether and how to roll back the operating frameworks adopted during the financial crisis in the course of “unconventional” policy tools such as quantitative easing (QE). My findings suggest that they could give less priority to reducing money market volatility than in the past. And, as shown in the case of the BOE’s pre-crisis framework (the RAF), frameworks designed to reduce volatility in good times may not work as well when liquidity conditions deteriorate – suggesting that flexibility to accommodate changing liquidity conditions should be given higher priority. Matthew Osborne works in the Bank’s Sterling Markets Division. Previous Post The growth of peer-to-peer lending platforms and prospects for banks’ disintermediation – hype or real threat?